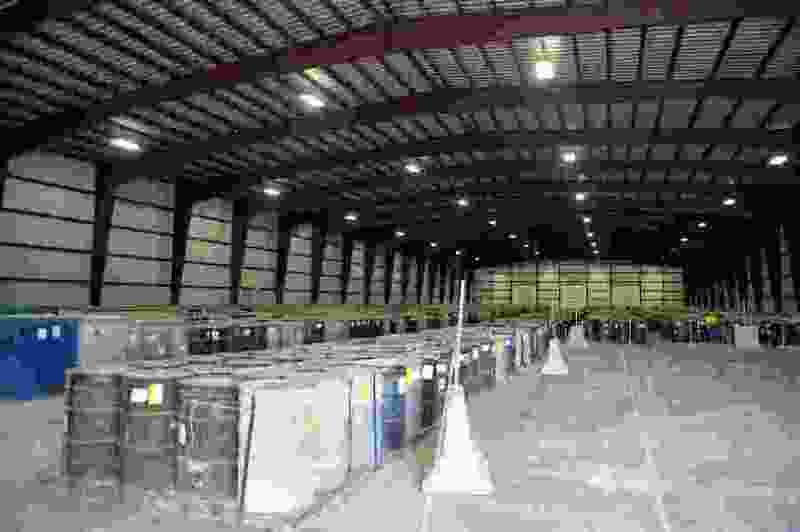 (Photo courtesy of EnergySolutions) In this 2015 courtesy photo, EnergySolutions is temporarily storing barrels of depleted uranium in a controlled warehouse at their Clive facility in Utah's west desert. The Utah Department of Environmental Quality is finalizing its regulation for how this waste will be processed. It will eventually be buried in a cell at the Clive facility. EnergySolutions is asking for a fast-track approval to accept a large amount of depleted uranium (DU) munitions, which is Uranium 238 metal that is pulled from mined uranium during processing to increase the concentration of fissionable U235. The separation process results in U238 concentrated with much less radioactive uranium and it is about 40 percent of the radioactivity of mined and natural uranium in the ground. It is used in anti-armor munitions by tanks, Navy anti-missile guns and ground attack aircraft like the A-10. Due to concerns about its effects on unintended targets, it is being phased out of service. New technology is also making it less useful. The major environmental effects of DU/U238 munitions is similar to lead and its chemical effect on individuals is more of a concern than its radioactivity. Long term though, it will decay to lead and, in the process, it will give off radon and other radioactive elements. The effect of burying tons of U238 munitions is similar to having a big concentrated uranium mine buried near the surface. Its location should hopefully be far from populated cities and highways and roads. EnergySolutions’ Clive facility is a few miles from I-80. Over the last decade, EnergySolutions has been trying to accept thousands of barrels of “depleted uranium” oxide from Savannah River, a South Carolina nuclear weapons plant that contains material that has been irradiated in a nuclear reactor. Although much fissionable and useful material (mainly plutonium and U235) has been removed, it contains, according to its manifest, technetium (which can only be created in a reactor), plutonium 240 and neptunium 237 (usually only available from a reactor). The material in the barrels contains many dangerous products that are deadly if ingested. Interestingly, plutonium 240 increases in radioactivity five times in 100 years and that means that it cannot be used in nuclear weapons. The materials that are considered waste in the process are mixed in with U238 and that material is considered by EnergySolutions “depleted uranium,” as it is the major component and is stored in the barrels at Clive, Utah. Recently, EnergySolutions has modified its labeling of the barrels to depleted uranium oxide and it has labeled the U238 munitions as depleted uranium metal. This is a big change from EnergySolutions’ presentations in the past decade. The differences between DU munitions and the DU barrels are significant, but EnergySolutions, in the past, has confused the two different materials. Former CEO Steve Cramer, on a Red Meat Radio Hour, said that the depleted uranium in the barrels could be used to grow vegetables. He obviously was thinking of the UN report that studied the effect of DU munitions that were fired in Kosovo farmland. That study found that the Uranium 238 was ingested and it was expected that the long-term effects would be similar to lead. The important takeaway from Energy Solutions history with “depleted uranium” is that it is confused about the material and it obviously should not be trusted to safely and adequately handle depleted uranium oxide or the material in the barrels. Before any “depleted uranium” is accepted to be stored by EnergySolutions, it should clearly differentiate between material that has gone through a reactor, like the Savannah River barrels, and the depleted uranium munitions which unfortunately litter our west salt flats from the USAF training gun range. The material in the barrels is a powder oxide and I consider it to be more dangerous than properly stored nuclear fuel rods, as it can easily escape the barrels which do not last long. Without properly labeling the different materials involved, we cannot have an objective analysis and honest public discussion. Utah should not allow a fast-track approval to store more DU until EnergySolutions understands, acknowledges and accepts that the barrels contain material that is much more dangerous than depleted uranium. George Chapman is a former candidate for mayor, a retired nuclear engineer and has worked with DU munitions in the Navy.